Design By Humans: Free Shipping! - Blog @ That Awesome Shirt! Design By Humans: Free Shipping! Humans, rejoice! 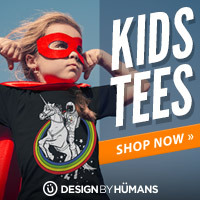 The graphic tees and cool designs at DesignByHumans.com now has sizes available for little humans. Our growing selection includes little humans t-shirts, tanks, and hoodies for boys and girls. In celebration of our newest launch, we are offering FREE shipping for a limited time. Starting now through June 23rd, receive free worldwide shipping on all apparel with no coupon code needed. Offer ends 23rd of June, 2015.